Montréal, May 20, 2018 – Canadian driver Alex Tagliani finished 14th in Sunday’s NASCAR Pinty’s 2018 season opener at the 3.957 kms (2.459-mile) Canadian Tire Motorsport Park road course, located near Bowmanville, Ontario. Starting from fifth on the grid, Tagliani kept his Chevrolet Camaro ZL1 EpiPen-RONA-St Hubert in the top three during the first 42 laps of the event and then took the lead from lap 43 to 48. With only three laps to go, his car began to slow down following a mechanical breakdown. The Clarington 200, a 51-lap race, was won by Louis-Philippe Dumoulin who crossed the finish line ahead of Marc-Antoine Camirand, with American Noah Gragson coming home in third place. Twenty-two drivers started the race and 18 crossed the finish line with 12 cars on the lead lap. In 59 NASCAR Pinty’s Series starts, Tagliani has six wins, eight poles, 22 top-fives and 38 top-ten finishes. Fans can visit Alex’s Facebook page https://facebook.com/Tagliani to find out more on the Canadian racecar driver. 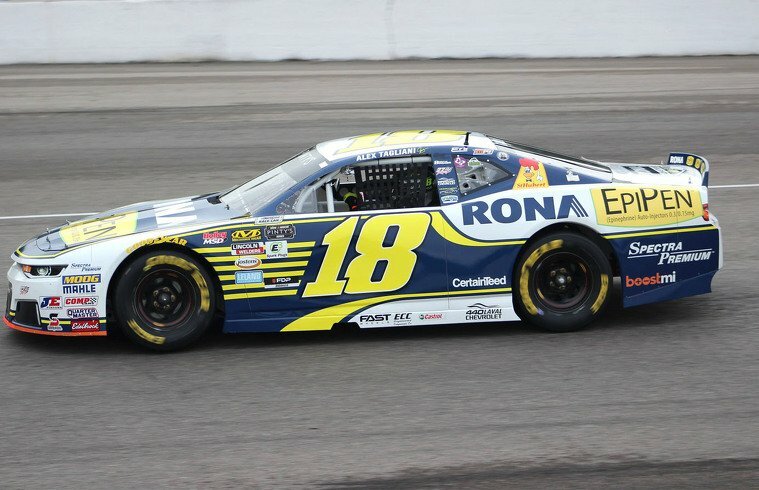 They can also follow Tag on Instagram @Tagliani18 as well as on Twitter @Tagliani at https://twitter.com/tagliani during his season-long quest for top honours in the NASCAR Pinty’s Series. Round 2 of the 13-race 2018 NASCAR Pinty’s Series season, a one-day affair will be held Saturday, June 15 at the Jukasa Motor Speedway one kilometre (0.625-mile) oval track located near Hamilton, Ontario. The Clarington 200 will air on TSN4 on Sunday, May 27 at 4:30 p.m.